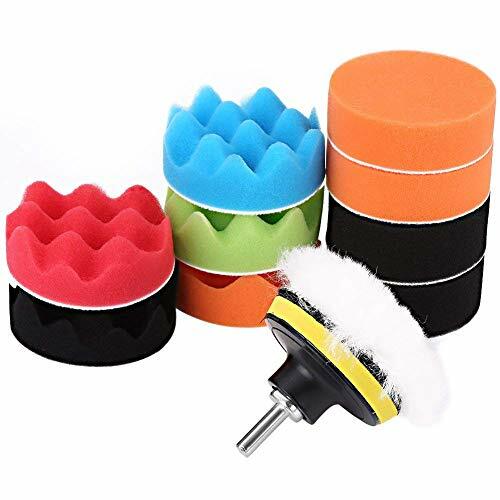 12pcs Polisher buffer pad set, mainly used for car polishing and buffing, for general car paint, furniture polished finish! Very convenient and effective! Used for all kinds of coat paints' waxing, polishing and sealing glaze, to clean and improve their lightness. Black (Extra Fine) Polishing and Finishing Pad ,Provides a rich swirl-free high gloss finish. Blue (Medium) Light Cut & Polishing Pad, Final cutting, polishing or glazing clear coat surfaces. Orange Coarse Foam Polish Pad Standard grade cutting pad ,Excellent for enamels,acrylics and urethane. Woolen pad for Finish Polishing Excellent for hard topcoats and clearcoats. Red (Extra Coarse) Aggresive Cutting. Green Fine Foam Polish Pad Final cut, polish, finishing pad. Please allow 1-2mm differences due to manual measurement."